Hidden for decades behind a huge fig tree, this mine was finally exposed, after the tree burned and died. Years of Operation: A patent claim was placed on this mine the same year as the Horseshoe Mine, in 1909 by the Saunders family. Most of the actual mining was done by Theodore Veuhoff and his two sons from 1930 to the early 1950's. 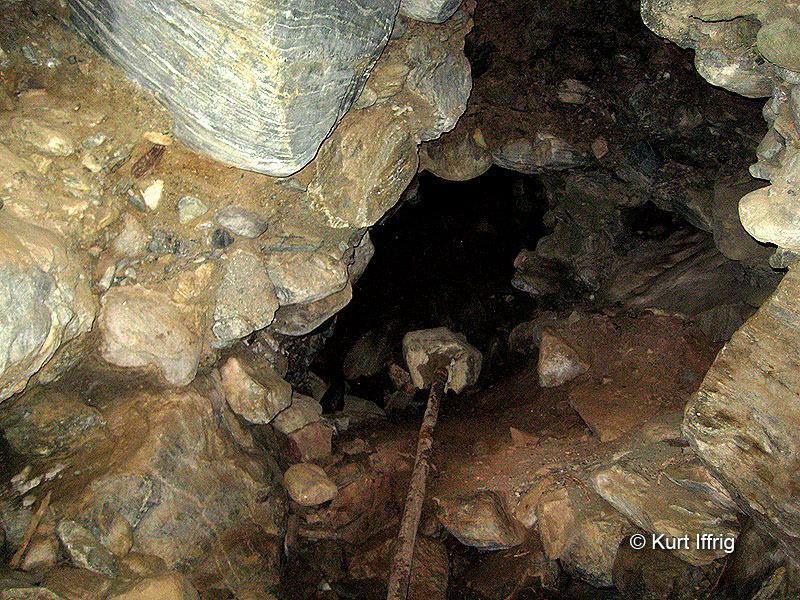 Depth: Because this mine has been used as a mountain lion's den I have only explored a small portion of it. However, the late Hugh Blanchard reported that the mine goes in for about 128 feet. At that point there is a low crawl, which opens into a five foot high tunnel and continues for another estimated 500 feet of crumbly alluvial breccia. 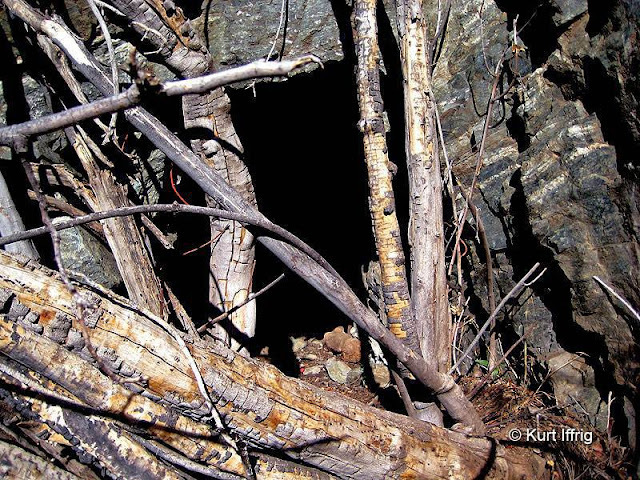 This mine has been used as a den by a mountain lion. Note the fang puncture marks in the scapula bone. 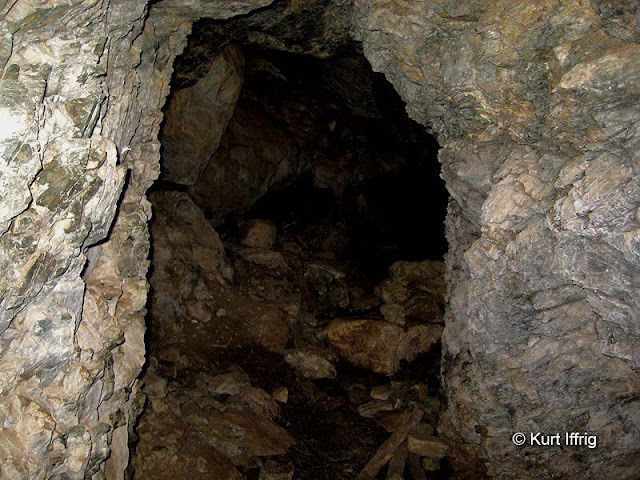 The Horseshoe Annex, also know as the Elvira Veuhoff Mine has been an elusive one. Well hidden behind a giant fig tree, this mine may have never been found again, had it not been for a fire in 2006, known as the “Nowhere Fire”. Firefighters who were flown in to fight the fire cut back branches next to and in front of the mine. The fire also burned away brush on a plateau area below the mine, exposing the remains of an old stone cabin, presumably used by the original miners. 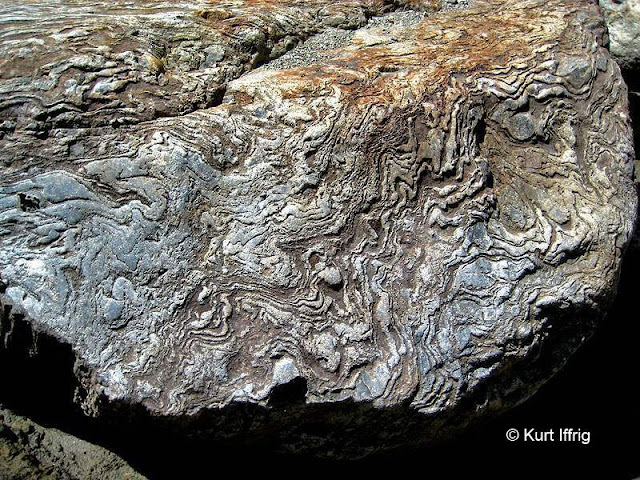 Prior to this, even the forest service was unaware of the mine's existence. To this day, the land on which the Bridge To Nowhere and both of the mines rest is owned by the Saunders family. Interestingly, John Robinson, the well known author of several books on mines of the San Gabriels never mentions the Horseshoe or the Horseshoe Annex. Although this mine is related to the Horseshoe Mine, it is hidden and much more difficult to find. Both the Horseshoe and Horseshoe Annex claims were owned by R. Cowper Saunders, patented in 1909. However most of the mining in the Horseshoe Annex was done a German immigrant and his two sons from about 1930 to the early 1950’s. 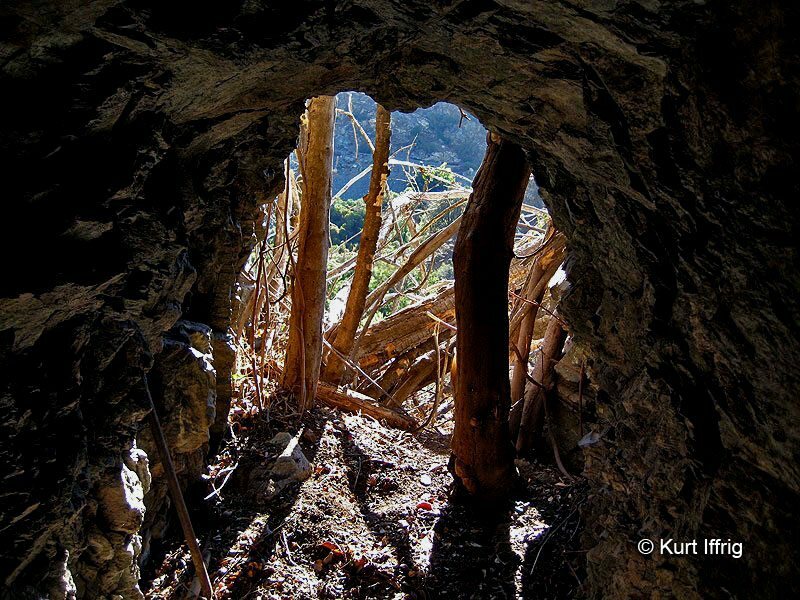 Theodore Veuhoff renamed the mine the "Elvira Veuhoff”, after his daughter, and planted the fig tree that has concealed it for nearly a century. Information on this mine came from a conversation between the legendary mine explorer Hugh Blanchard and Stephen Veuhoff, Theodore’s great grandson. I opted to stay out of the narrower parts of this mine, for fear that a mountain lion might still be inside. 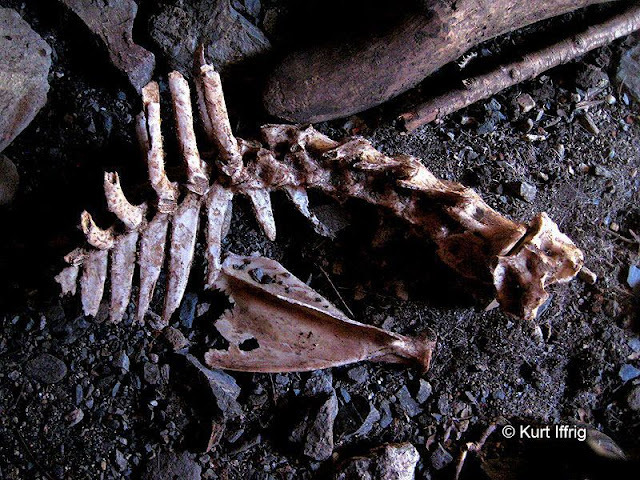 When I first located this mine I peered inside through a tangle of dead branches, and saw what I thought was a human skeleton and a few pillows laying next to it. “Oh my God, what the hell’s in there?” The human part was wrong, it turned out to be the remains of a Bighorn Sheep. However the sheep was dragged in by a mountain lion. Although it was not a fresh kill I was extremely nervous going inside. The pillows turned out to be sand bags, probably left behind by firefighters in the 2006 Nowhere Fire. Just inside the portal I picked up a long metal bar to fight with, as if that would have done much good against a full grown cat. Mountain lions are the fourth largest cats in the world, and the second largest in North America. 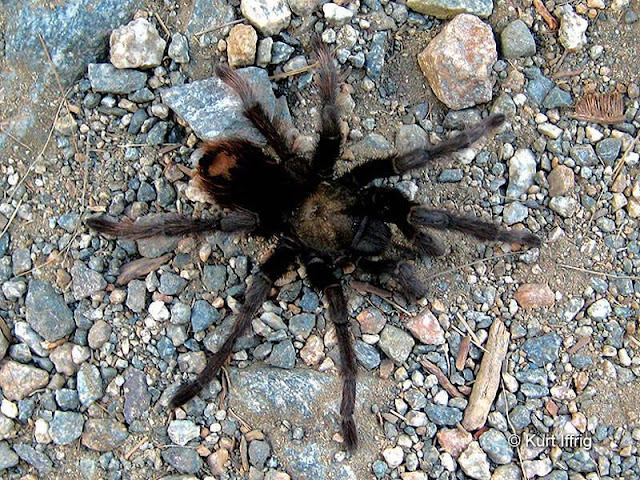 They can grow up to 230 pounds, all solid muscle, and although they generally leave humans alone, they will kill you in an instant if they’re cornered in a tight area. I stayed in the mine long enough to take a few photos, but opted to stay out of the tighter areas. The Horseshoe Annex was owned by the R. Cowper Saunders, but largely mined by Theodore Veuhoff. 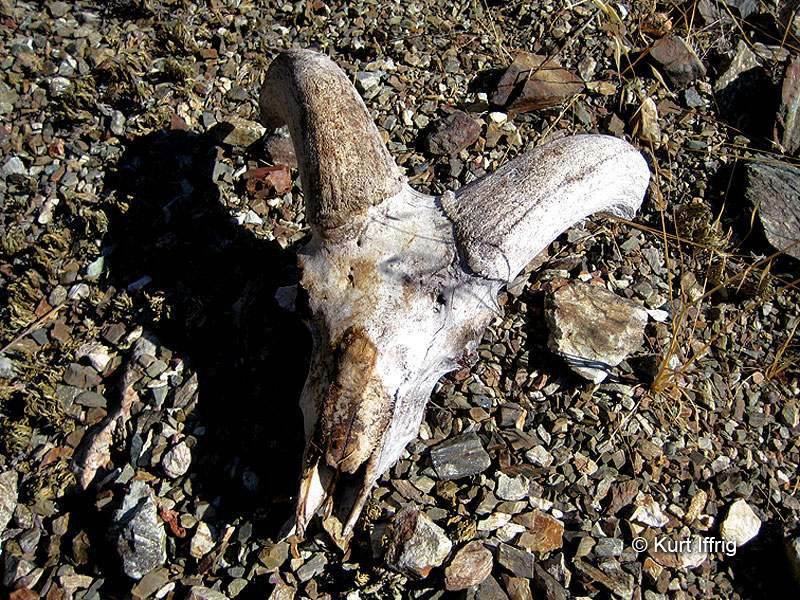 About 200 feet from the mine I found this Bighorn skull, which probably belonged to the skeleton in the mine. After crawling out of the Annex Mine I started searching for a possible miner’s cabin on the mountainside. I never found one, but I did find the beautiful Bighorn skull pictured above. It probably belonged to the same animal whose bones were found inside the mine. 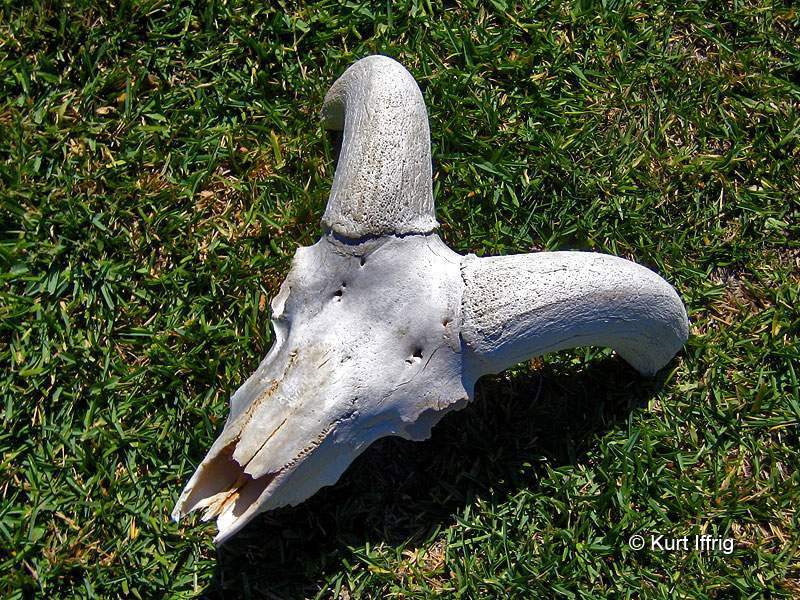 This was actually the second Bighorn skull I’ve come across in the East Fork. The first was much further upstream, near the Iron Fork, and it was still attached to the skeleton. I left that one where it was, and always regretted it. This time I took the skull home, and my arm was sore for a week from carrying it out. I got a lot of strange looks on the trail from other hikers. When I finally got it home I decided to bleach it, and now it hangs proudly on my wall. If you ever find a skull, here’s what you should know and how you can professionally bleach and disinfect it…. Here's the finished product. This skull is now disinfected, bleached and mounted proudly on my wall. 1) Many animals carry zoonotic diseases (diseases that can be transmitted to humans) even after the death of the animal. Wear gloves if possible when coming in contact with the carcass. If not, be sure to wash your hands thoroughly later on. 2) If the skull still has flesh on it you will need to macerate it (remove the flesh) both inside and outside of the skull. The simplest way to do this is by finding an ant hill and placing it there until all of the flesh is removed. Ants clean the skull without damaging the structural integrity. If an ant hill is not available you can soak the skull in a large bucket in room temperature water with a small amount of laundry detergent. Detergents contain enzymes that will break down the organic matter, but may take anywhere from a few days to a week to work. 3) After the flesh is removed you’ll want to remove any remaining grease, by soaking it once again, this time in dishwashing detergent. This step is important because grease left on the bone will start to smell after awhile. Change the water every day until it appears clear. 4) Let the skull dry thoroughly before you begin the bleaching process. Leave it in a place that doesn’t attract scavenging animals or insects for several days. 5) When it comes to bleaching, use hydrogen peroxide as opposed to chlorine bleach. Chlorine can damage bone and teeth. Also, peroxide will leave the skull a more natural off-white color. In a large bucket, totally submerge the skull or bones. I used a 35% industrial solution sold at restaurant supply stores, but the standard 3% solution sold in drug stores will also work. It just takes longer. You can dilute the peroxide with water, just realize that this will extend the bleaching time. 6) After all this soaking the teeth may or may not fall out of the tooth sockets. Save them if they do. You can glue them back in later with a small amount of super glue. 7) Check the skull each day until you are pleased with the color. Then take it out of the solution, wash any residue off with a hose and let the skull dry outside for at least 24 hours. At this point the bones will be totally disinfected and stripped, so you won’t need to worry about bugs. 8) The final step is optional. You can seal and protect the skull with several coats of polyurethane spray, available at hardware stores. This will give the skull a shiny finish and protect it for life. I opted not to seal the one that I found, however you might want to do this if you plan on mounting the skull outdoors. These are the ruins of a miner's cabin on a rise between the Horseshoe and Horseshoe Annex Mines. 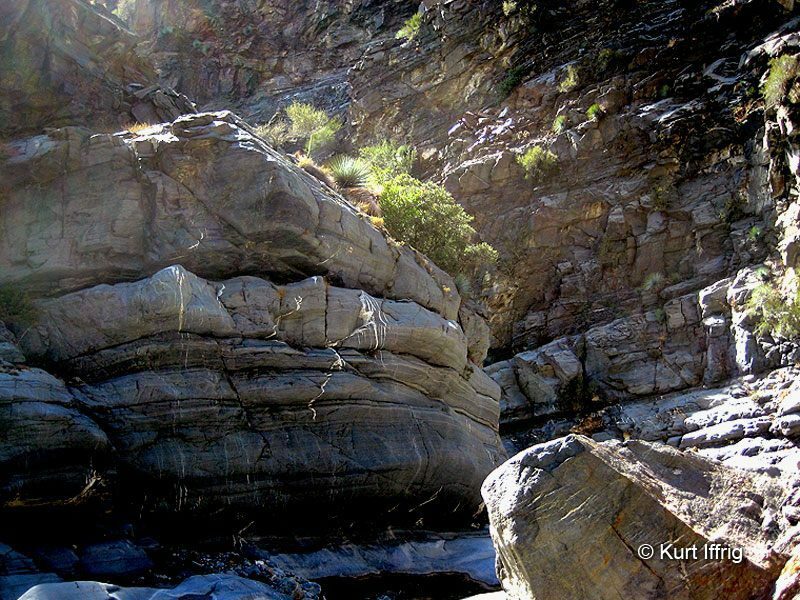 During several trips to the East Fork I kept noticing what appeared to be a trail cut into the side of a red rock cliff on the west bank of the canyon south of the bridge, with faintly visible switchbacks ascending the mountainside further north. On the day I found the Horseshoe Annex Mine I decided to finally climb up there to see what it was. It was indeed a trail, though it was apparent that it had not been used for some time. I followed it across the cliff wall and soon found an old fallen trail marker, buried in the brush. You can see the sign in the photo below. 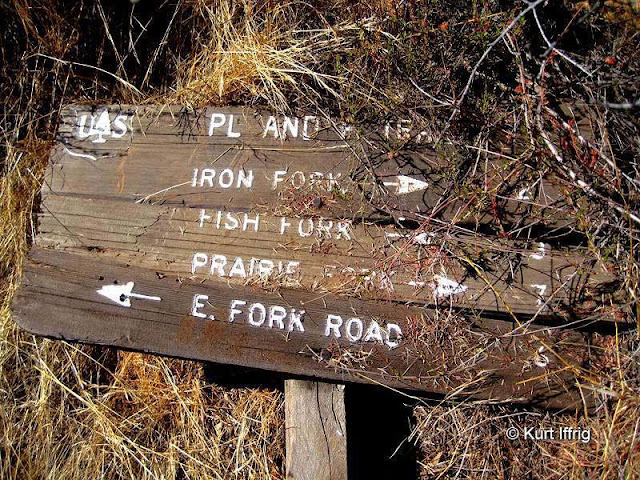 The title on the sign was PL and P Trail, something I had never heard of before. I continued to follow the trail until it faded away, at a beautiful vista of Devil’s Gulch. This gulch is the home of a spectacular waterfall and the remains of at least one miner’s cabin. On the same day I found the Horseshoe Annex Mine I stumbled across the long lost PL and P Trail. I decided to research this trail, and the only mention I could find of it was in John Robinson’s book, Trails of the Angeles. It turns out this is an extremely old trail, most of which has washed away over the last century. Built in 1911, just two years after Cowper Saunders patented the Horseshoe and Horseshoe Annex Mines, the Pacific Light & Power Trail spanned the western wall of the East Fork. Built with the intention of adding power lines and a projected power plant below The Narrows, this trail bypassed an often flooded section above the Bridge To Nowhere, which leads to The Narrows. Most of this trail is long gone, washed away by rain and landslides, however many of the old power poles remain, and a section a switchbacks which I have not yet explored is still visible on a steep slopes south of the bridge. A view of Devil's Gulch from the PL and P Trail. Beyond this point the trail has been washed away. According to Robinson the old trail traverses above The Narrows and then descends to Iron Fork and Fish Fork campsites. This trail is said to be extremely eroded and dangerous in those locations. Bear in mind that Robinson’s book was written some time ago, so conditions may be even worse by now. Above Fish Fork the canyon is said to become less precipitous and the trail continues to follow the east slope for about 2 miles, before descending to the broad streambed, continuing all the way to Mine Gulch, 5 miles above Fish Fork. At this point the stream splits into three tributaries, Mine Gulch, Vincent Gulch and Prairie Fork, four miles below Vincent Gap. If the road that was once attached to the Bridge To Nowhere had not been washed away in 1938, it would have connected to the Angeles Crest Highway, near Vincent Gap and Wrightwood. Narrows above the Bridge To Nowhere. Bighorns above started a landslide here that nearly killed me. Recently I took a trip up to The Narrows, an rugged area about a mile above the Bridge To Nowhere. I was searching for a route to a remote mine called the Stanley Miller which I have long wanted to find. This mine is high on the western side of Iron Mountain and there is no trail leading to it. At least one person has died from a fall while trying to find it. Supposedly artifacts litter the hillside, and the mine itself cannot easily be spotted. I plan to give this a try in the spring, after the winter rains have receded, so you may be seeing this mine on an upcoming page. Bizarre patterns on a sedimentary rock near the narrows. I wish I could tell you how this was formed. The Narrows is a beautiful area where the walls begin to converge and spectacular rock formations can be found. Along the way you’ll find all kinds of mining equipment stashed by modern day prospectors, but few if any people. 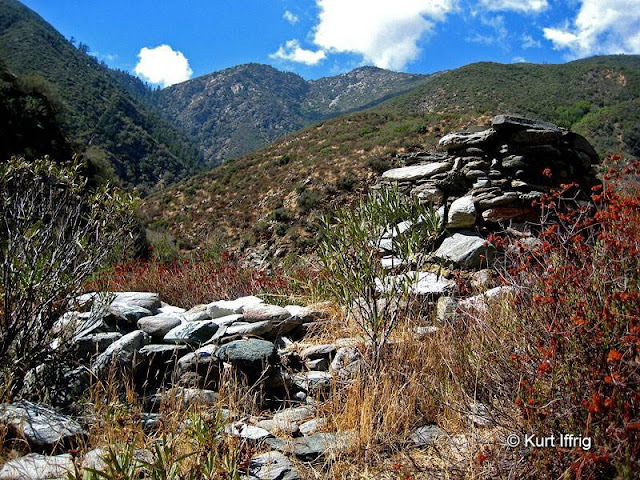 If you continue north, past The Narrows, you’ll eventually wind up at Vincent Gap, just three miles from Wrightwood. This is where the road through the East Fork, which washed away in 1938 was intended to connect to the Angeles Crest Highway. 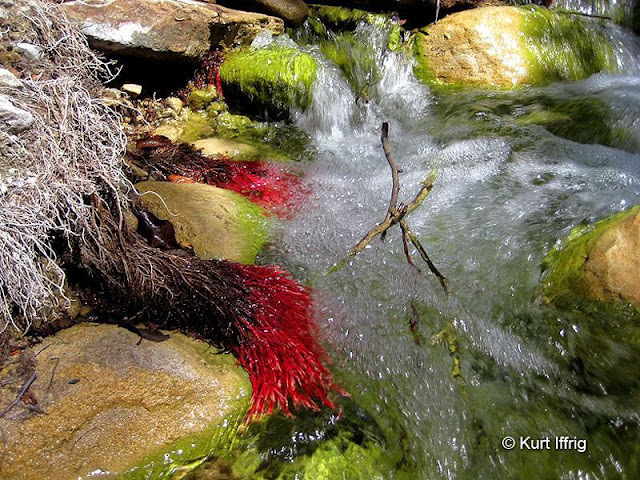 One tree species has roots that turn bright red near the water's edge. I have seen this in several canyons. On the way back from The Narrows I was exploring a narrow side inlet when rocks started falling from the cliffs above. At first it was just one or two, but eventually a landslide started. I could see the two Bighorns who were causing it up above me, but was powerless to stop them. There was really nowhere to hide, and the rocks were getting progressively bigger, so I ran and dove under a log. It’s a good thing that log was there, because it took a beating. The “rutting” or mating season for Bighorns is usually between July and December. At that time the males become extremely violent. Perhaps they were fighting each other or knocking down rocks intentionally, I’ll never know. The best time to see tarantulas is late in the afternoon or at night, when they come out to hunt for food. 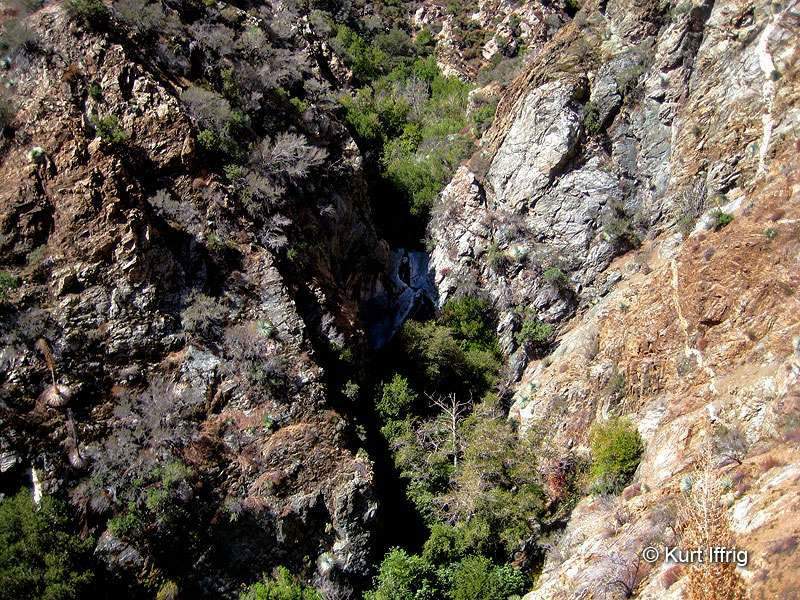 In January of 1861, the most ambitious geological surveys of that time were carried out in the San Gabriel Canyon and far beyond. 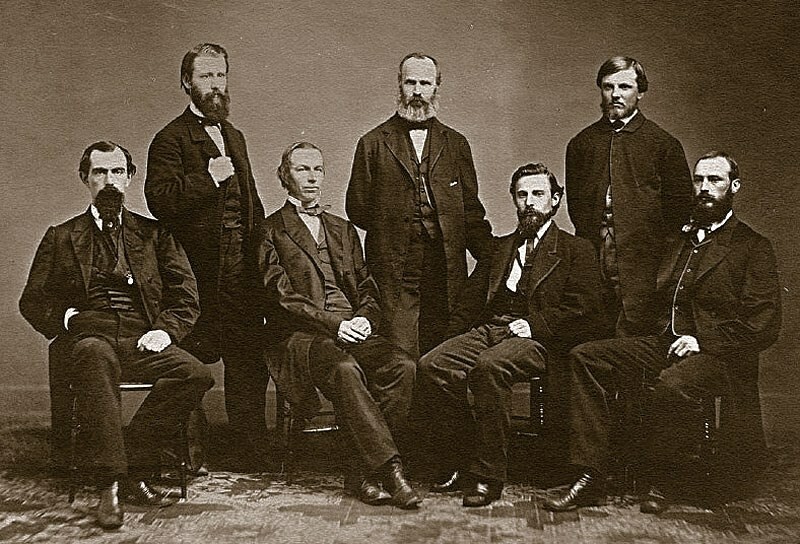 Josiah D. Whitney was appointed by the Office of State Geology to carry out the monumental task of mapping mountain regions throughout California, recording gold and silver mines along the way. Mt. Whitney in the Sierra Nevada mountains is named after him, as is the Whitney Glacier on Mt. Shasta. Whitney was a professor of geology at Harvard University, and Chief of the California Geological Survey from 1860-1874. Whitney's survey team included two assistants, a paleontologist, a topographer, a geologist and a botanist. Throughout his travels and studies in the mining regions of the United States, Whitney became the foremost authority on the economic geology of the U.S. In all, he travelled over 14,000 miles in the new state of California, much of which was barely known and some of which had never been explored by white men. Were it not for his efforts, the San Gabriels and Sierra Nevadas may not have ever been thoroughly mapped.